The temperature in New York had reached the low 80s when I schlepped downtown for Sam Lewitt’s Less Lights Warm Words at the Swiss Institute. Entering the gallery, which is nestled between the frenzy of Canal street and SoHo, it immediately became clear that the title of Lewitt’s intervention was a massive understatement. 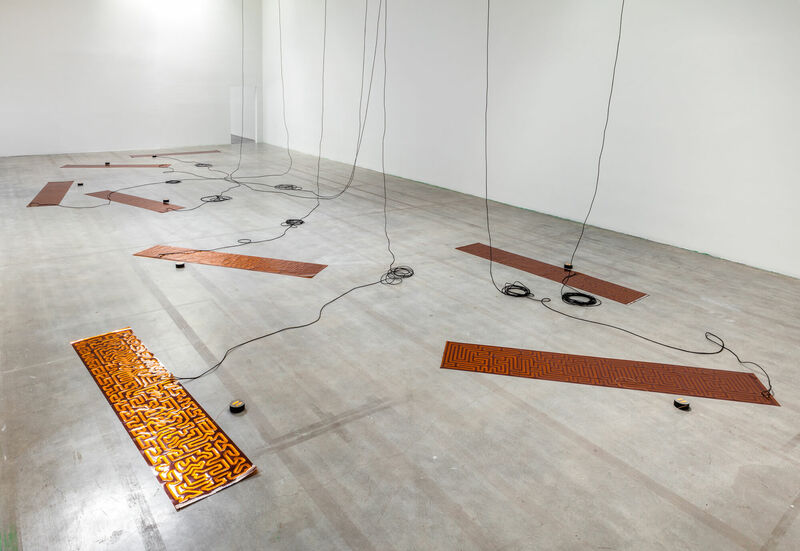 Dispersed throughout the otherwise serene gallery space are large-scale copper heating circuits connected to the tall ceiling with loosely hung black wires. Dominating the exhibition more thoroughly than these sculptural apparatuses, however, is the gallery’s remarkably high temperature. The excessive heat, reaching more than 100 degrees—unexpected, even for June in New York—is generated by Lewitt’s intervention in which he rerouted, and exhausted, the energy normally used to light the spacious Wooster street location. The New York-based artist achieved this transformation employing enlarged versions of the heating circuits used in common electronic goods to maintain their suggested temperatures. The sensorial result? A surplus of fever and absence of light, which are enduring preoccupations for the artist. The exhibition marks the third and final iteration of Lewitt’s ongoing More Heat Than Light series, which saw previous installments at Kunstahalle Basel and The Wattis Institute for Contemporary Arts. The “warm words” referenced in the exhibition’s title are appropriated phrases that embellish the floor circuits, nearly camouflaged within their labyrinthine circuity. Drawn from generic texts found in electronic merchandise manuals, cryptic expressions such as “WEAK LOCAL LINEAMENT,” “CUSTOM PROFILING,” or “VACUUM SEALED” infuse lyrical rhythms into the understated mechanical circuitry, complicating the notion of their technological functions. Transforming exhibition viewing into a physical experience for those who can brave the heat, the artist claims his own narrative in institutional critique. Focusing on paradigms of displaying and experiencing art, Lewitt’s installation problematizes dualities: inside versus outside, seeing opposed to touching, or meaning against function. The summer heat and monotony of the everyday, normally left outside the gallery, instead occupies its interior where visual expectations inherently inflate: we expect something enthralling, or perhaps shocking, here. However, while Lewitt’s technical and conceptual acumen is unmistakable, the exhibition’s aesthetic humbleness elevates the work’s conceptual charge. Additionally, relying on the sense of physical feeling—one of the senses least conjured in experiencing art—the installation degrades the primacy of seeing and hearing. In the dimmed gallery where nothing but enlarged circuits and occasionally legible words sprawl on the floor, the sight remains important only at auxiliary level. Immersed within the confines of gallery space, the interior temperature fluctuating in response to the outside temperature, Lewitt’s audience sways on a fluid orchestration of senses. In her 2005 Artforum essay “From the Critique of Institutions to an Institution of Critique,” Andrea Fraser scrutinized the distinctions between what is inside and outside of the gallery space, emphasizing the inquisitive approach artists working with the framework of institutional critique—Michael Asher and Daniel Buren to name a few—bring into exhibition spaces. Recently, in Down the River, Fraser herself, to much hype, completely emptied the Whitney’s column-free fifth floor, exposing her audience to nothing but the museum’s boundless Hudson River view and audio recordings from a correctional facility. Both Fraser and Lewitt subvert dynamics of their exhibition spaces: one at a mainstream New York museum, and the other within a smaller and more experimental “downtown” space. The former supplants a visual experience for an audio one, swapping the sense and sounds of one type of institution for another; the latter lays bare the electrical infrastructure of the building itself, very literally undermining the institute’s power. “There are artists that seek to show the structure of power, but I’m more interested in the structure of the visibility of power,” Lewitt said in a recent interview. Manipulated algorithms, custom-programmed codes, and aestheticized electronic components routinely find their way into gallery spaces these days—Lewitt’s own Casual Encounters at Miguel Abreu Gallery a few years ago is emblematic of this direction. With Less Lights… Lewitt’s work materially relates to these technological trends, while remaining conceptually connected to forebears like Fraser. The soothing simplicity of the emptied white cube of the Swiss Institute contrasts the complexity of the work’s technical achievement—a duality central to Lewitt’s practice. He calls upon the legacy of critical spatial interventions, while keeping focus on the influence of technology in everyday dynamics—he used Airbnb recently to locate a space to exhibit in New York for a week. In rendering physical the social patterns and institutional structures that typically remain unseen Less Lights Warm Words turns up the heat of institutional critique. Osman Can Yerebakan is a writer and curator based in New York.